Walk guests on The White House as a Home Walk, led by our dear Quentin Roosevelt, frequently ask him what church his father, the president, and the family attended while living in Washington, DC. With the help of our dear friend Toby Selda, educator and author at Sagamore Hill in Oyster Bay, New York, we have some information about this. Side Bar: The Reformed Church in America (RCA) is one branch of the Reformed Church that broke from the Roman Catholic Church during the Protestant Revolution in Europe. It was initially called the Dutch Reformed Church and was founded by settlers with Dutch heritage living around New Amsterdam (New York) in the early 1600’s. The other branch of the Reformed Church is the German Reformed Church founded by German settlers living near Philadelphia, Pennsylvania in the early 1700’s. 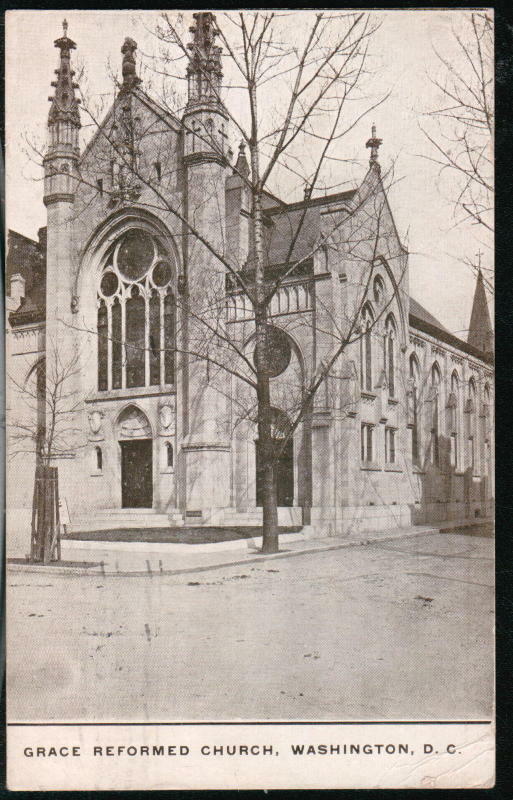 Since there were no RCA congregations in Washington, DC, while he lived there, TR chose the Grace Reformed Church because it had liturgical and theological similarities to Dutch Calvinism. Dr. J.M. Schick was pastor at the Grace Reformed Church at that time and he welcomed the president on a regular basis. Theodore often walked from the White House to attend Sunday morning worship services at Grace Church. He was usually accompanied by two Secret Service men, and often with family members or friends. He regularly had flowers sent to adorn the altar from the greenhouse at the White House and was a faithful communicant between 1901 and 1909. He is also reported to have taken part in all the service, singing every hymn, and listening to the sermon, even jotting down notes on the sermons. His regular pew is still in the church. Theodore’s philosophy was quite ecumenical. In addition to attending the Grace Reformed Church on a regular basis, he frequently accompanied his wife, Edith, and the family to services at the Episcopal Church. Theodore strongly opposed religious persecution and prejudice. In October 1958, President Dwight D. Eisenhower attended a special Sunday morning worship service at Grace Reformed Church that commemorated the 100th birthday anniversary of Theodore Roosevelt. Side Bar: President Martin Van Buren was also a member of the Reformed Church in America as were Fred Trump and Mary Anne MacLeod Trump, parents of President Donald Trump. Grace Reformed Church continues to honor the legacy of Theodore Roosevelt today. Our Theodore Roosevelt Room contains displays of memorabilia, pictures, and artifacts that honor the President and also document his connections to the church. In addition, the church is honored to posses an original portrait of President Roosevelt that was made during his time in office. The portrait is available for viewing by appointment, along with the rest of the displays. Grace Reformed Church is always adding to our collection. For information about possible donations of historical artifacts, pictures, portraits, documents, or other items associated with President Roosevelt, please contact the church offices.